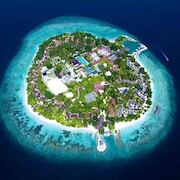 The Maldives islands are comprised of 26 atolls, or chains of islands, with more than 100 islands total. With practically each resort having its own island, you can truly have a unique experience each time you visit this paradise in the Arabian Sea. Aside from the bright white sand beaches and dreaIN island air, the Maldives provide travellers with an opportunity to visit historic mosques, museums, and other attractions. Enjoy a sensory-pleasing stroll through local produce markets, and spend a day out on the sea snorkeling or diving Kuda Giri. 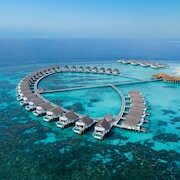 Whatever your travel objectives, your next Maldives holiday starts right here on Expedia.co.in today. 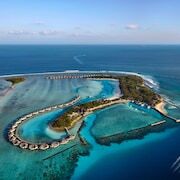 Maldives accommodation is grand by nature, each offering a reclusive retreat on a picturesque island. Many resorts are reachable only by ferry, but once you arrive you are treated to private beaches, clear blue water just off the shore, swimming pools, hammocks, and more. Some Maldives luxury resorts even offer overwater bungalows, letting you stay up close and personal with the sea while your worries wash away. 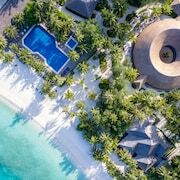 You can find the perfect Maldives resort for you right here on Expedia.co.in, where we make it easy to find the best deal. The largest airport serving the Maldives is Ibrahim Nasir Male’ International Airport (MLE). Once you arrive, you will take either a boat or seaplane to your final island destination. Taxis and motorbikes are common ways to get around on these islands, and of course you can always explore these small islands on foot. This island paradise is a respite from daily life, and a once in a lift time holiday for many travellers. Whether you want to escape on your own or travel with companions, the Maldives are sure to deliver a dream trip. 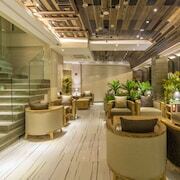 Make your stay most comfortable by booking one of the top Maldives hotels. Expedia.co.in makes it simple to filter hotels and resorts by amenities, location, brand and more. Best of all, you will never pay an Expedia booking fee.